When you are designing a new fireplace for your home, you may want to consider incorporating gas logs. A propane fireplace that is equipped with gas logs will provide you with the warmth and comfort of a conventional fire, with none of the hassle. Gas logs rely on innovative technology to provide you with instant fire on demand. 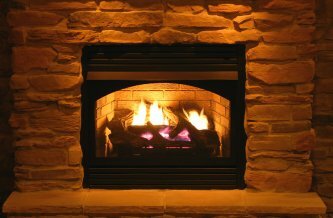 A company offering gas logs in Chantilly can help you design the perfect gas fireplace for your interior space. After your gas log installation, you will be able to enjoy your fireplace, at any time. Read on for an overview of how gas logs work. A gas log is composed of piping and a set of ceramic logs. These logs can be placed in many different types of fireplace spaces. The pipes pump invisible gas through holes in the logs. When the gas logs are ignited, the ceramic logs will produce a steady flame. As propane or natural gas is pumped through the pipes, it burns harmlessly on the surface of the ceramic logs. Unlike the process of building a fire, igniting a gas log is a very simple procedure. Your igniting process will depend on the type of controls that are installed in your fireplace. Some gas logs can be switched on using a knob, whereas others can be controlled using a remote system. Your gas log installation specialist can design an ignition set up that is suited to your lifestyle and preferences. Before a gas log can be used safely, the area around the log must be made flameproof. For example, your installation technician may need to line the interior of your fireplace with lava rocks or sand. These materials ensure that the fire does not spread out. Additionally, you may choose to have a glass panel installed to contain the gas log. Once these items are in place, you will be ready to use your brand new fireplace. 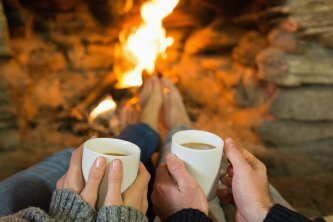 While a natural wood-burning fireplace in Chantilly can provide a warm and comfortable atmosphere to get you and your family through cold winter nights, this type of heating system also comes with a number of drawbacks. Fortunately, gas fireplaces can be used to create a similar experience without the negative consequences. Keep reading to take a look at some of the advantages of gas log fireplaces. 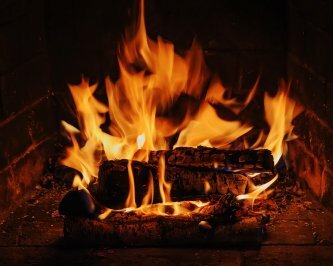 Traditional wood-burning fireplaces offer a pleasant environment at the expense of relatively extensive maintenance and clean up; between setting up the wood, enjoying the fire, and cleaning up the ash afterwards, starting a fire in a wood-burning fireplace is always a project that takes a few hours. Gas log fireplaces, on the other hand, are designed with convenience in mind. Simply turn on the fireplace whenever you want to use it and turn it off when you are finished; many gas logs can even be operated via remote control. You will not have to add additional logs to the fire to keep it burning and you will not be left with a substantial amount of ash to clean up once you put the fire out. Additionally, gas logs are so much cheaper than wood that the fireplace may pay for itself in savings in as little as two years. If you are concerned with the impact your habits have on the environment, you will be pleased to learn that gas log fireplaces are more environmentally friendly than their traditional wood-burning counterparts. Wood-burning fireplaces aggravate already existing pollution concerns by introducing particulate matter into the atmosphere, whereas fireplaces that burn natural gas do not. While gas logs are not completely emission free, they do enjoy substantially reduced emissions compared to wooden logs. Gas log fireplaces eliminate the various safety concerns that wood-burning fireplaces present. You will not have to worry about creosote coating your chimney and creating the risk of accidental combustion. Termites will not be able to infest your home through natural wooden logs, and there will be no harmful sparks being emitted from your chimney as you enjoy your fire. 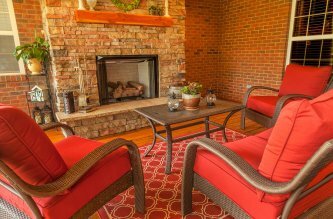 The luxury of comfortably sitting by the hearth in Chantilly is one that everyone should be able to enjoy; however, this luxury comes with hidden consequences if you burn wood in your fireplace . Fortunately there are several other kinds of fireplaces that can provide the aesthetics and outdoor heating you are looking for. Here is a brief overview of some of the alternatives to wood-burning fireplaces. Wood-burning fireplaces present a number of hazards and drawbacks that other types of fireplaces do not; in addition to the fact that they hurt the environment by contributing to global warning, they also create toxic smoke that is harmful if inhaled. If you are really in love with the look of a traditional fireplace but not in love with the threats they pose, a gas fireplace may be the right choice for your home . Gas log fireplaces are safe and effective alternatives that can be just as aesthetically pleasing as their traditional counterparts. They are composed of gas burner modules and gas logs, which are made to look indistinguishable from real wood. These fireplaces are not completely infallible as they do produce small amounts of pollution, but the smoke is directed through a vent and out of the house; they are much less harmful to the environment than wood burning fireplaces. 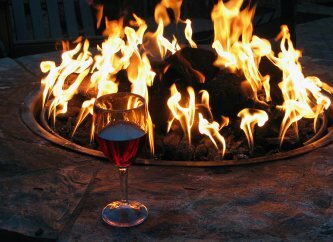 Individuals who place a heavy emphasis on aesthetic appeal over warmth and function may gravitate towards alcohol gel fireplaces. This type of unit can replicate the sounds and scents of a traditional fireplace, and different scents are available for purchase. Odorless fuel is also an option for those who do not enjoy the classic fireplace aroma. If you are especially concerned with your carbon footprint and environmental impact, an electric fireplace might suit your needs. Unlike gas and alcohol gel fireplaces, this type does not create any pollution at all. It is powered by electricity and newer models can create realistic looking flames with the help of advanced lighting technology. Electric insert fireplaces are also likely to enjoy a substantially longer working life than gas fireplaces.